An asylum seeker is a person who has lodged a claim for protection under either the 1951 Refugee Convention or Article 3 (prohibiting torture, or inhuman or degrading treatment or punishment) of the European Convention on Human Rights. A refugee is someone who has been forced to leave his/her country in order to escape war, persecution, or natural disaster. According to the 1951 Geneva Convention on Refugees a refugee, is a person who is outside their country of citizenship because they have well-founded grounds for fear of persecution because of their race, religion, nationality, membership of a particular social group or political opinion, and is unable to obtain sanctuary from their home country or, owing to such fear, is unwilling to avail themselves of the protection of that country; or in the case of not having a nationality and being outside their country of former habitual residence as a result of such event, is unable or, owing to such fear, is unwilling to return to their country of former habitual residence. In legal terms such a person is termed an ‘asylum seeker’ until they have been granted asylum, when they can be termed a ‘refugee’. There are, at time of writing, January 2016, with violent conflicts taking place in Africa, Syria and other places, an estimated 60 million refugees in the world today. The largest numbers of new refugees are coming from Syria, Afghanistan, Somalia and South Sudan. Numbers of new refugees have increased dramatically between 2012 when there were 10.5 million, to mid 2015 when there was 15.1 million. The global refugee population grew in three and a half years by 45 per cent. It is important to note that it is the neighbouring countries and often the poorest countries which are taking in the vast majority of the world’s asylum seekers. Sub-Saharan Africa hosts the largest number (4.1 million); Asian and the Pacific region (3.8 million), Europe (3.5 million) the Middle East and North Africa (3 million). Turkey is taking the most refugees, followed by Pakistan, Lebanon, Iran and Ethiopia. In terms of the number of refugees hosted by thousand inhabitants, Lebanon took the most followed by Jordan, Nauru, Chad and Turkey. By mid 2015 the main destinations of new asylum seekers were Germany, Russian Federation, US, Hungary, Turley, South Africa. This is the context in which to understand the UK’s contribution to providing refuge. About 2 per cent of the world’s refugee population live in the UK. The number of people seeking asylum in the UK peaked in the early 2000s with 84,130 applications (excluding dependants) in 2003. It has remained much lower since this point. In 2014, there were 31,300 new applications for asylum in the UK. 59 per cent of asylum applications were initially refused in 2014. Of those refused around 75 per cent lodged appeals. Subsequently 28 per cent of appeals in 2014 were successful. By the end of 2014 there were 117,161 refugees, 36,383 pending asylum cases and 16 stateless persons in the UK: amounting to 0.24 per cent of the population. 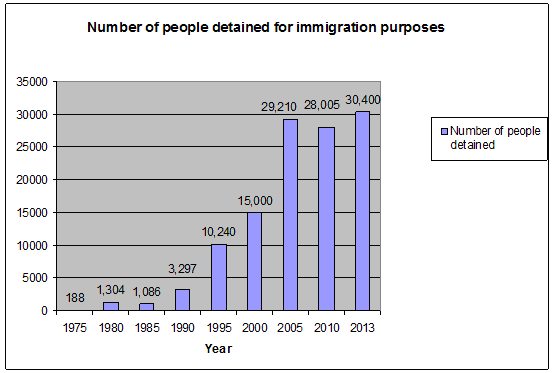 The number of people detained for ‘immigration purposes’ (by which, what is usually meant is asylum seekers or others detained to facilitate their removal, process asylum/immigration claims or to establish their identity) in the UK has increased massively since the powers to detain were introduced in the 1970s. According to the Migration Observatory, approximately 30,400 people were detained for immigration purposes in the UK in 2013, the majority of whom were asylum seekers. Comparatively, 188 people were detained in 1975. Despite continued pressures from a cross-party group of parliamentarians and activists, there remains no statutory time limit on how long a person can be detained, meaning that many people are held for years. During the first two quarters of 2015 (January to June), there were 271 incidents of self-harm requiring medical attention in immigration detention. There have been 1,221 incidences whereby detainees have been formally noted at risk of self-harm during this period. In 2008, the UK Border Agency claimed that it ‘removed’ one person from the UK every eight minutes. In 2014, 38,767 people were removed from the UK or departed ‘voluntarily’ after the initiation of removal. 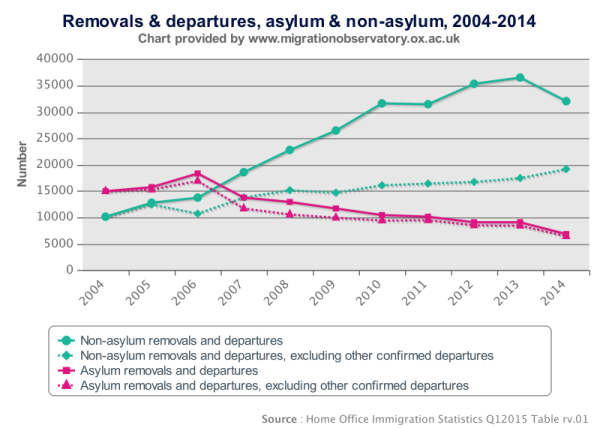 The majority of those who are deported or removed are not asylum seekers. In 2014, 6,788 asylum seekers were removed (approximately 18 per cent of all removed persons). In 2006, 18,280 people were removed. Asylum seekers are not allowed to work, except in very rare circumstances. Asylum seekers who have not yet had a decision on their claim generally receive accommodation and financial support set at about two-thirds the level of income support if, otherwise, they would be destitute (Section 95 support). In 2015, a single adult in this situation would receive £36.95 per week (£5.28 per day). This support is normally terminated soon after a decision (positive or negative) is made on the claim. The government estimated that, as of 31 March 2015, around 2,900 families (approximately 10,100 people) were in receipt of Section 95 asylum support. On 10 August 2015, Asylum support for families and those with dependants was reduced, meaning that a single parent with one child now gets £73.90 instead of £96.90; a single parent with two children will receive £110.85, compared to £149.86; and a couple with two children will receive £147.80 instead of £178.44.